10% of all proceeds are donated to Room to Read, an international charity focusing on literacy and gender equality in low-income communities. Wondering what book to read next? Trying to remember the name of that book recommended to you by a passing acquaintance? Love a particular author and wondering which book of theirs to dive into next? Then Book Therapy would love to hear from you! Our resident book therapist Bijal Shah is here to address your questions and will be publishing a weekly Q&A blog post on the most pressing literary needs starting July 25, 2018. All we need is your questions about what it is that you are looking to read and we will gladly oblige! You’re invited to email bijal@booktherapy.io with your questions, reading interests, needs and habits. Feel free to tell us about your favourite books — both old and new, when you read best etc. Your preferences for fiction/non-fiction, audio vs kindle vs paperback. We will then take your question away and connect you with the perfect book for you. If you can’t wait for the weekly Q&A blog post or need something sooner you can always request a personalised book prescription (i.e. a tailor-made reading list with a minimum of 7–10 books personally hand-picked for you) with a guaranteed turnaround time of 48 hours. Feel free to check out our blog and A-Z of Book Prescriptions (both for adults and children) which cover in-depth book reviews and recommendations. 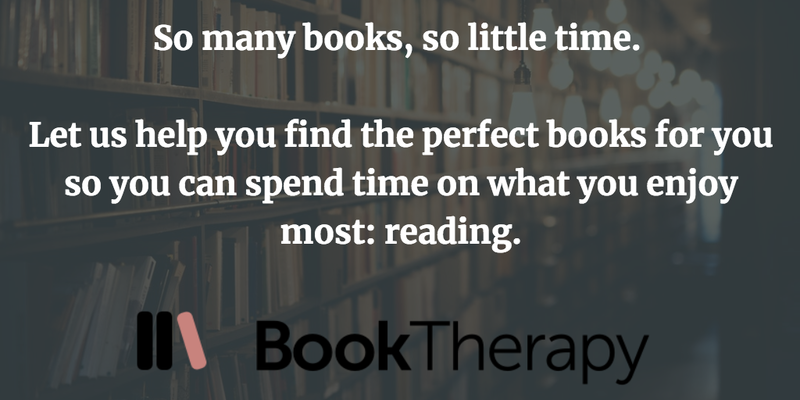 Book Therapy’s mission is to help you find the perfect book for you. Life to too short for books that are not your type! We look forward to hearing from you. Why audiobooks are perfect for parents and four great ones to start the year. What to read, who to read, literary news and promotional discounts on personalised reading lists, book therapy shorts, literary remedies, literary travel guides and books. Directly to your inbox.